Flag Off ceremony of Team ITBP Arunachal for the 2nd Phase of “Oorja CAPF under-19 Football Talent Hunt 2017” held today at North- Eastern Frontier Head-Quarter campus amidst loud cheer and enthusiasm, by Mamta Rawat, Mentor, Himveer Wives Welfare Association, NE FTR HQ, ITBP, was the chief guest of the event. 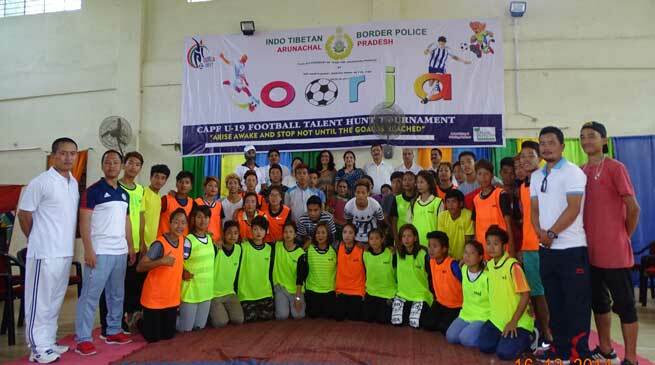 Addressing as chief guest Marnta Rawat conveyed her best wishes to both Girls & Boys teams of ITBP Arunachal and elucidated that it’s a great opportunity for the hidden talents of this state to exhibit their skill in the Football game through this tournament. Further Mamta Rawat told that it’s a matter of pride that girls of this state also particitipated in the ls‘ phase with full of zeal and hope you will continue the same in 2″“ and 3’“ phase also. She urged the HWWA members too inspire their children to participate in the games which is a great source of healthy and wealthy life. Afterwards Manoj Singh Rawat, Inspector General, NE FTR HQ, ITBP presented souvenir of this tournament to the chief guest. Dy. Inspector Genera] S.K. Shanna, Commandant (Staff}[CCD), SHQ(1TA) Brij Mohan Shah, All Officers of NE FTR HQ and SHQ(ITA), Himveer Wives Welfare Association members, Subordinate Officers and Jawan Deputy Director Sports Mala Lingi also witnessed this historical moment. Talking to this ITBP IG MS Rawat said team members of twenty from our state selected from the players who played the games held recently last month. They have been trained for last fifteen days at Sange Laden Sports Acadmy (SLSA) at Chimpu and are being sent to Shillong tomorrow and will pay the NE level tournament from June 14-22 June with other team from different states of Region. And in month of July at New Delhi wherein six team form all region of the country will be playing for Prime Minister trophy. Apart of participant two officers from ITBP, Itanagar are also leading the team to Shillong,.